Last week’s revelations that the Cult Of The Grey Shepherd worshiped a good dog-god, Matdamon, and an evil trickster one, Krungle, define the events of “Forward.” It not simply that Ryan is convinced that Wilfred is the evil god, but that Ryan is convinced that Wilfred has an external existence. “Forward” may be the first episode of Wilfred thus far that takes place entirely under the assumption the Wilfred is a real being, and not an extension of Ryan’s psyche. I’m a little bit torn on whether this is a good move or not. It’s definitely a refreshing change of pace to not have the usual twisted morality play of “Ryan wants to do something but has to argue with Wilfred about it,” and I don’t mind the mythological aspects of the show being explored. However, I’m just not certain that the specific story this time around is enough to carry the episode. Wilfred puts a bunch of skeezy-looking stuff in a backpack and forces Ryan to open it at a daycare that Kristen wants Joffrey to attend, it spills, and Ryan gets kicked out. So he and Wilfred argue about why the things that were in the bag were in there. The big problem is, well, Wilfred does have some explanations for why they’re there, but it’s not insightful nor particularly funny. It’s just…a few skeezy items. 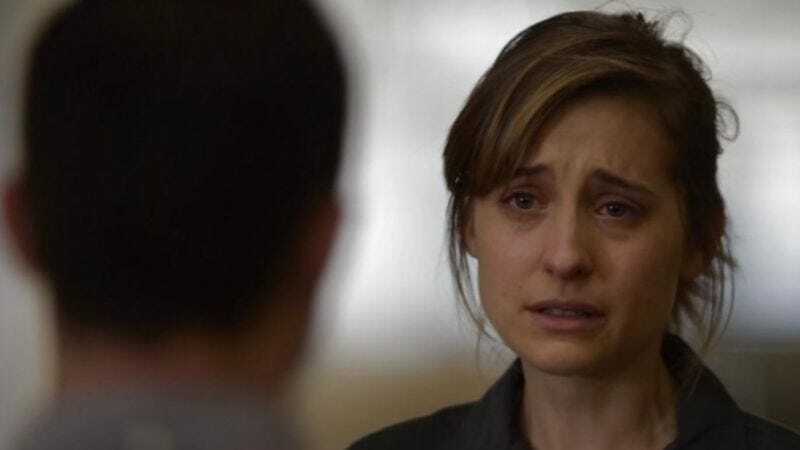 All of this leads to the kicker, that Amanda (Allison Mack) is working at the daycare, and Wilfred was doing all he could to prevent Ryan from seeing her and suffering. I’ve made no secret of my belief that Mack and her character were two of the best things to happen to Wilfred, and for the show to complete without bringing her back would have been a disappointment. However, her return here felt only partial. Part of the reason she was so great on the show before was her combination of flighty silliness and her legitimately human pathos. Wilfred has rarely embraced either of those things whole-heartedly—its silliness has almost always had a dark, ironic tinge, while its emotions are always mitigated by the question of how crazy Ryan is/how real Wilfred is. Most every other character, especially Ryan’s family, has existed to highlight those things, while Amanda existed partially outside them and thus was able to change them. But “Forward” doesn’t give Amanda both sides of her personality. She’s not funny or charming here, which was what made her so instantly appealing at the start of season two. We do see her emotional side, as she tells Ryan that in order to heal, she needs to remain apart from him. And it does manage to hurt a little bit. But that’s colored by the earlier conversation where Ryan accused Wilfred of deliberately driving Amanda crazy in order to hurt him—we don’t know how valid that might be. Nor do we know if Mack is going to be on the show again. If she isn’t, I’m glad we got at least this brief goodbye, but if she is, it feels like a deliberate weakening of this episode’s plot in order to get to more meaty stuff later. Which is fine and common on television, of course, but it does slightly weaken this plot. Still, it’s quite effective for Wilfred to show one of its very few three-dimensional characters as human and as someone who has been hurt by her association with Ryan and Wilfred. The show has long been a fantasy of self-destruction/improvement where only Ryan actually seems to exist. That sort of narcissism can be painful, and only by departing from Ryan’s point of view, even briefly, could Wilfred manage to show it. “I’m just a dog. Any complex human emotion you see in me is just wishful anthropomorphization.” The easiest theory yet?